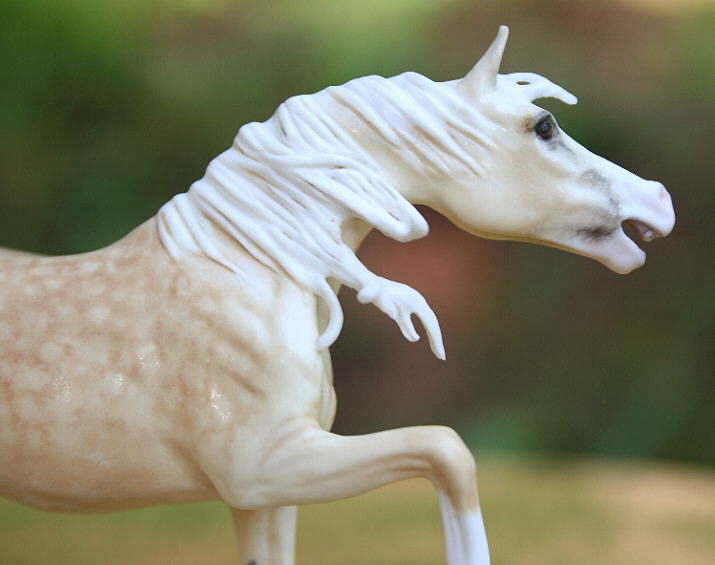 This first piece is the bone china mini foal "Eira" sculpted by David Mayer and produced by the now dissolved Alchemy-Earthworks. 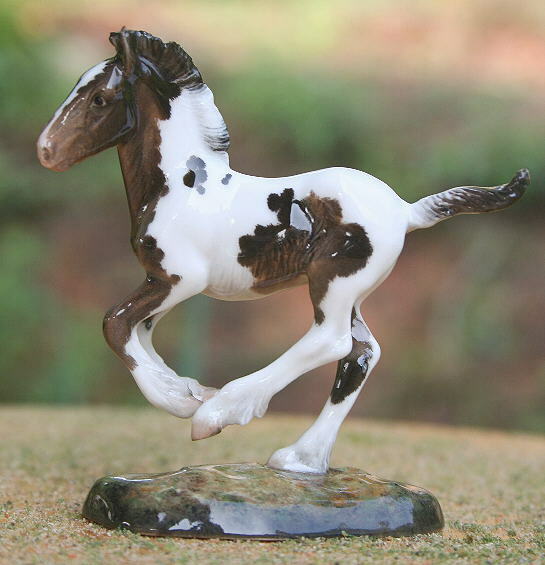 A delightful piece full of detail and animation, I have custom glazed this baby boy to a black or dark brown tobiano colt with gloss finish. I apologize for not having more photos but he's a difficult one to photograph with his shiny finish! Nice crisp detail on this piece with subtle grey and pink tints/shading in his white areas, tint of soil stains in his feathers, hint of hair pattern around the edges of his pattern. A real cutie, asking the same price I sold another custom glazed "Eira" foal for a couple of years ago at $425.00 plus shipping. 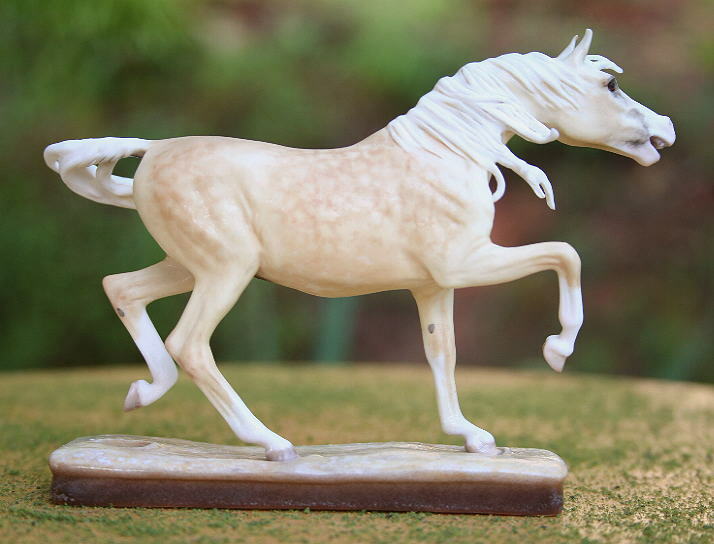 This piece is the AAA mini Thoroughbred sculpted by the wonderful Donna Chaney of Animal Artistry, and produced in bone china by Alchemy Ceramics of England. 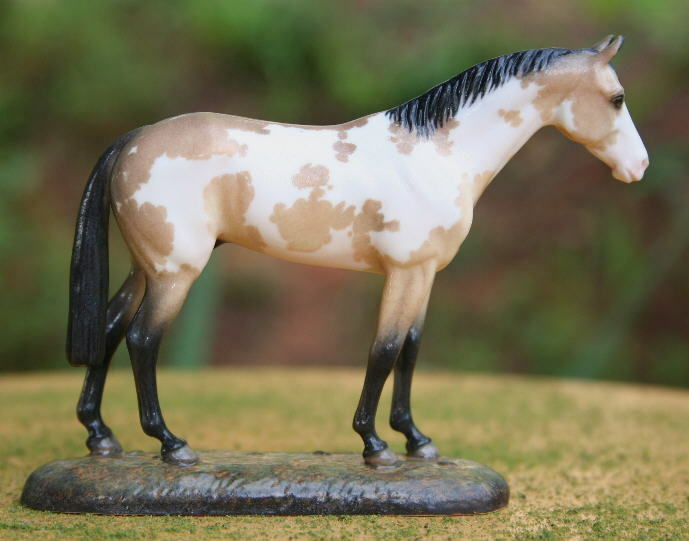 He has been custom glazed by myself to a lightly sooty buckskin overo pinto, or Paint with TB breeding, in satin finish. The offside of this piece shows where a bit of his overo pattern roans out on his back with soft ticking fading into his solid coat. 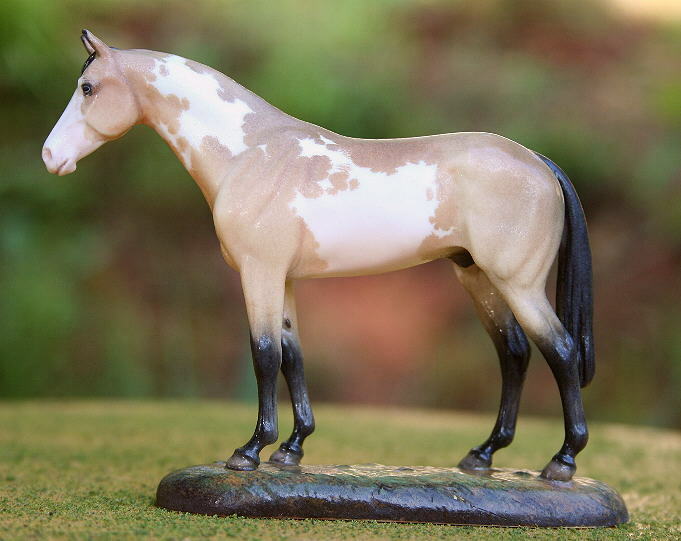 Although intended to be a lightly sooty bay, his color faded somewhat in the final firing to a sooty buckskin tint. I am asking $450.00 for this piece plus shipping. 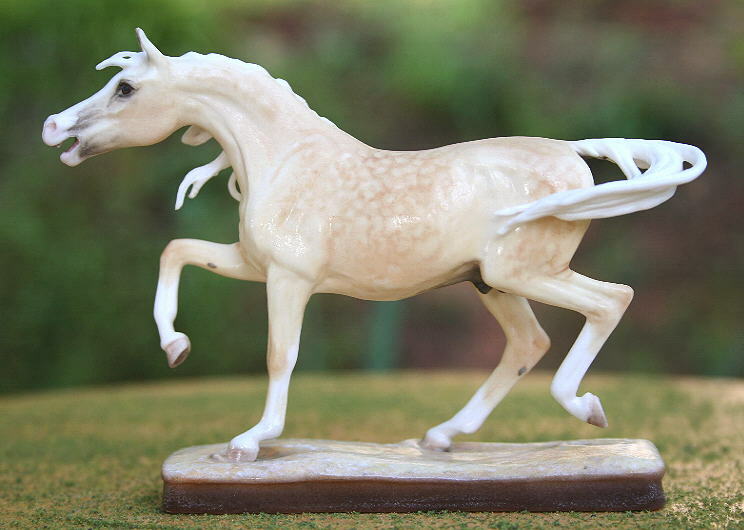 These next three photos are of the Nanse Browne mini Arabian stallion, a bone china piece produced in a limited edition of only 50 pieces by Alchemy Ceramics. 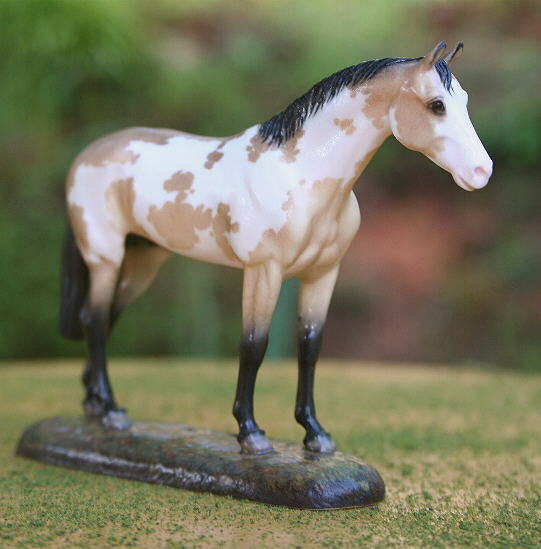 Here I have custom glazed him to a light dappled palomino in satin finish. He came out lighter and less carmel than I had hoped, but overall he's probaby a more realistic shade for the majority of real palominos out there - just not that ideal dark gold we so often desire! This piece is very artful and should make an excellant representation of a mixed bred Arab, high in his Arabian breeding percentage. I am asking $450.00 for this piece plus shipping. This next photo shows how his teeth are individually deliniated. He also has a subdued pink tongue with darker interior, nothing shocking red or baby boiled pink. :} His sabino white does extend high on his face and legs, with a hint of belly ticking, but no white spotting on his body. All pieces will be shipped USPS Priority Mail, fully insured with delivery confirmation tracking for $15.00. To enter this lottery drawing, please submit your full name, email address, and pieces in order of preference if you would like to be entered for more than one piece. I will have my son Beowulf draw the winning names from my hat on Friday morning before he departs for school. I will then contact those winners later that same morning. Entries may be recieved up until midnight, Thursday night. Payment will be accepted in the form of PayPal or USPS money order within 7 days of lottery winner notification. As always, all of my work comes with a satisefaction guarantee or your money back. I hope you like them! Please email me if you have any questions.